Parkinson disease is a debilitating and incurable neurodegenerative disorder, affecting approximately 1-2% of people over sixty-five years old. Oxidative damage is considered to play a central role in the progression of Parkinson disease and strong evidence links chronic exposure to the pesticide paraquat with the incidence of the disease, most probably through the generation of oxidative damage. In this work we demonstrated in human SH-SY5Y neuroblastoma cells the beneficial role of superoxide dismutase (SOD) enzymes against paraquat-induced toxicity, as well as the therapeutic potential of the SOD-mimetic compound M40403. Having verified the beneficial effects of superoxide dismutation in cells, we then evaluated the effects using Drosophila melanogaster as in vivo model. Besides protecting against the oxidative damage induced by paraquat treatment, our data demonstrated that in Drosophila M40403 was able to compensate for the loss of endogenous SOD enzymes, acting both at a cytosolic and mitochondrial level. 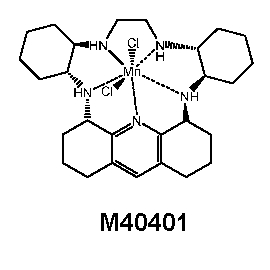 Because previous clinical trials have indicated that the M40403 molecule is well tolerated in humans, this study may have important implication for the treatment of Parkinson disease. Study demonstrates therapeutic potential of SOD-mimetic compound M40403 against Parkinson disease: Parkinson disease is a debilitating and incurable neurodegenerative disorder, affecting approximately 1-2% of people over sixty-five years old. Oxidative damage is considered to play a central role in the progression of Parkinson disease and strong evidence links chronic exposure to the pesticide paraquat with the incidence of the disease, most probably through the generation of oxidative damage.